The air was deathly still and an eerie silence fell across the Senior Library Learning Commons; only the faintest sounds of clinking munitions could be heard as weaponry was prepared… well, that’s what I would have been writing if this event had not proved itself to be one of the most highly anticipated, energized, exciting, noise manufacturing, crowd attending events we have seen! The noise in the Learning Commons was an excited roar! 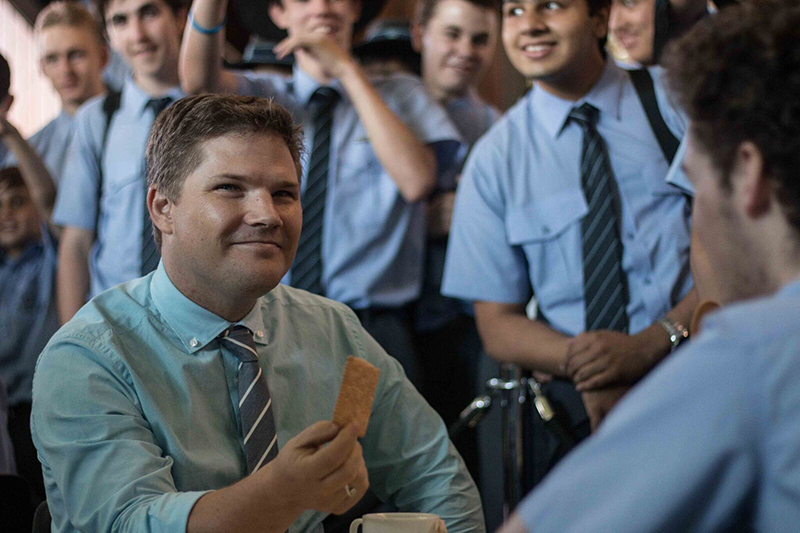 Who would have thought that dunking a biscuit into a cup of tea could excite so many students. Hundreds of eager faces crowded through the doors to view their favourite duelists battle it out in traditional Steampunk gentlemanly fashion. Each duelist showed remarkable skill, or if not, were remarkably funny to watch as soggy biscuit landed on their laps. 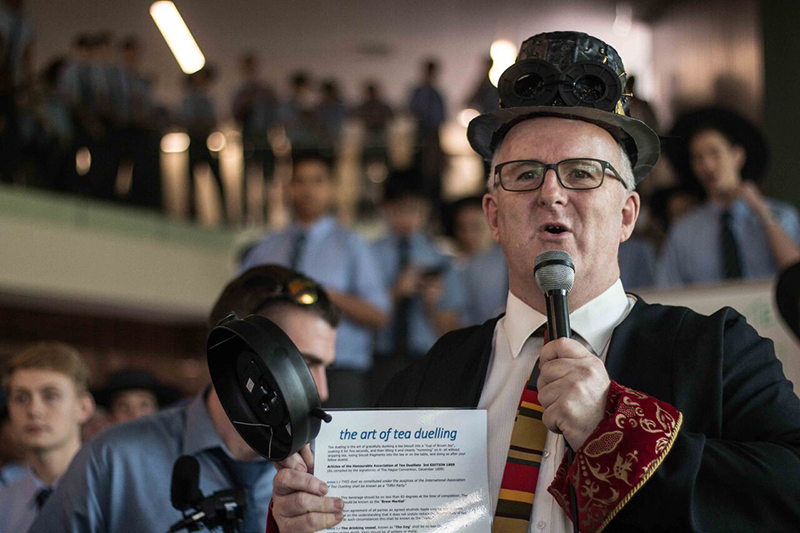 The event was part of the many Steampunk activities run throughout the first term and was clearly the most popular, at least from a spectator point of view. The duels were all carefully monitored and arbitrated by our own resident “Tiffen Master”, Mr Maloney and his team of deputies. 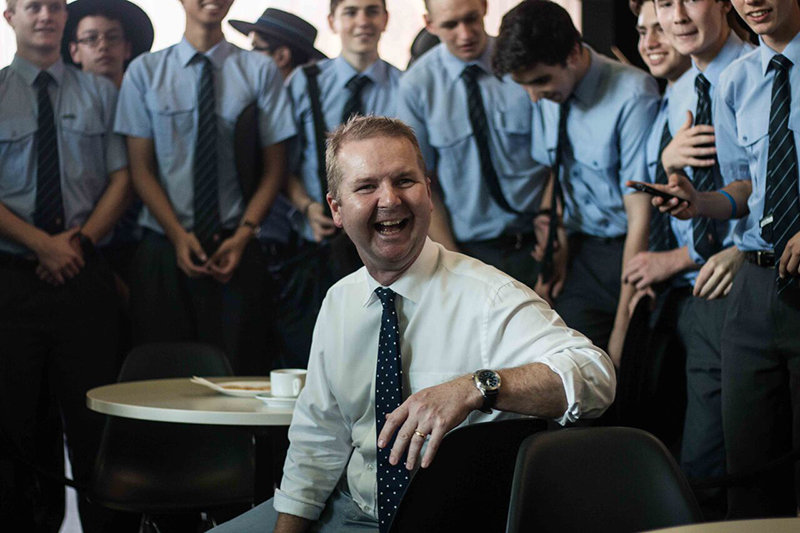 A big congratulations goes out to Mr Timms for winning against all challenging competitors and doing the teachers proud, and also an honorable mention to our runner-up from Year 10, Chris, who put up an amazing fight. Expect big things from Chris in the future. Crowd favourite Mr Venables was unfortunately defeated in the first round, but displayed excellent sportsmanship in the face of an unexpected early defeat. 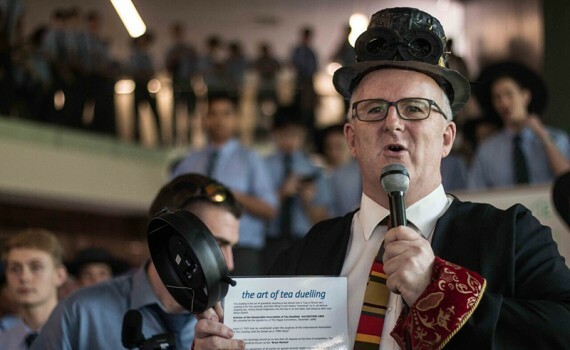 Despite his loss, the fans all look forward to seeing Mr Venables next year at the 2nd Annual Tea Duel Competition. Venables declined to comment on his early exit from the duels, but his charismatic smile said it all. He will be back! 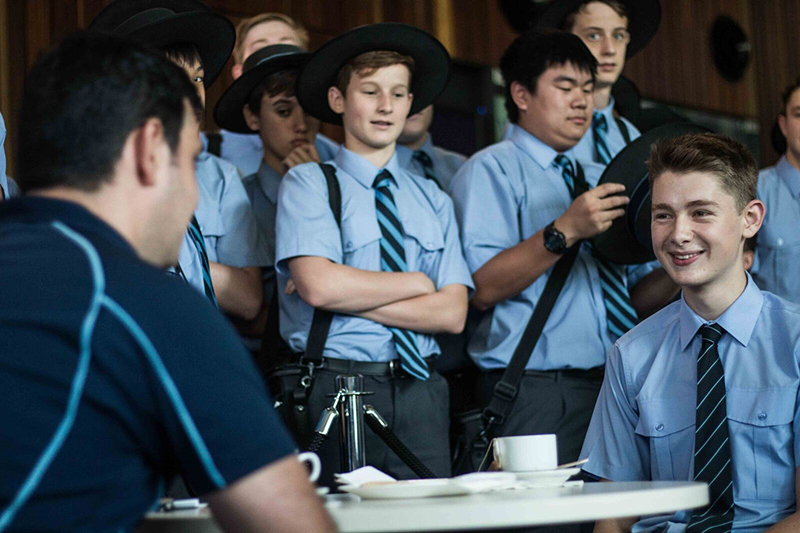 The only stain on otherwise perfect dueling session, other than the tea stains on the tablecloths and clothes, would be the disappointing cheating attempt undertaken by one particular contestant, a deputy principal who shall remain nameless. Drinking the tea and not dunking the biscuit properly was a blatant disregard for the rules. Luckily, nothing escaped the watchful eyes of the Tiffen Master and his deputies. Thanks to them and the Library staff the duels were fair fun and very hilarious!